If you are living on campus, your first stop will be the Key Distribution in lower Charter Hall to confirm your room assignment and pick up your room key. In the days leading up to Orientation, the Key Distribution will be staffed from the early morning until the last flight has arrived and been checked in. Soon after you are settled in your housing (on or off campus), you should visit the Orientation Office in Lower Taylor Hall on the True Blue Campus. The Orientation Office is open from 8:00 am to 8:00 pm beginning the Thursday prior to orientation week. Program specific orientation schedules, campus maps, tour reservations and chips for the Orientation Bazaar can be obtained from the office staff and upperclassmen will be there to answer any questions you have. Before arrival on campus, you should view your Self Service student account to confirm that you have clearance for registration check-in. If you have a hold on your account, you must follow up with the appropriate office to determine how to have the hold removed. If you did not submit your pre-registration forms prior to your arrival on campus, you must bring them with you to registration check-in. Once on campus, after you are settled in your housing arrangements, you should head to registration to check-in and pick up your student ID. Please bring an alternate form of picture identification and your student ID# (A00……) to verify your identity. At registration check-in, your clearance status will be verified. When it has been confirmed that you are registered for courses and have not had a Hold placed on your account, you will be given clearance for your student ID card and information on where to pick up your books. Orientation is a perfect time to get acclimated to your physical surroundings and to meet other new students, upperclassmen, faculty, and staff. 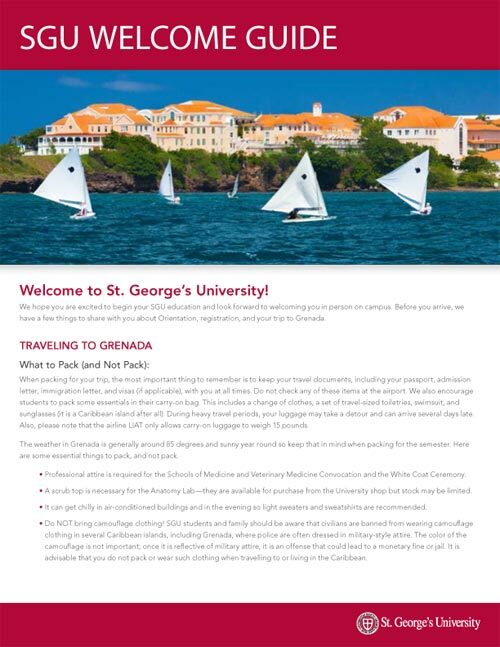 It is a time for making new friends and familiarizing yourself with all of the great opportunities that await you at St. George’s University. 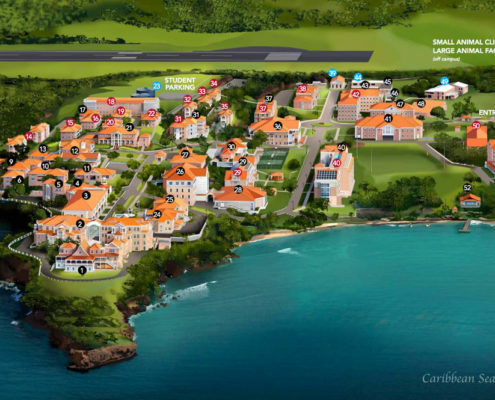 All entering students are expected to arrive on time for mandatory orientation sessions commencing in Grenada and/or the UK prior to the start of the term. 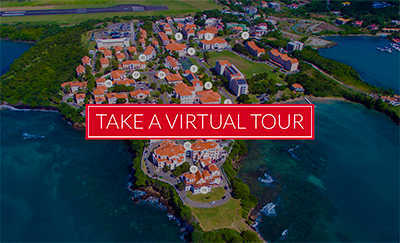 Details regarding session dates, times, and locations will be posted to the SGU website. Photos for your student ID can be taken at registration or submitted prior to arrival using Photo Capture. Student IDs are required to complete registration and access campus buildings, classes, University transportation, and Orientation activities, amongst other things. Instructions on how to upload a photo through Photo Capture will be emailed to you prior to registration. If you are a first-term medical or veterinary medical student, your textbooks will be ordered for you and can be picked up during orientation week. Do not buy these books prior to your arrival. Undergraduate (including premedical and preveterinary) and graduate students will purchase books at the University bookstore. Although Founders Library contains a large collection on reserve, consider bringing additional textbooks that cover material you will be studying during the term; for example, that old undergraduate biochemistry book that you never got around to re-selling—and frankly never wanted to touch again—might be a helpful resource. The library has all recommended texts for the Basic Sciences courses. In addition, the University bookstore sells texts required and recommended by the faculty. Bring any supplementary texts, such as board review books, of your own.